Amazon.com Inc. is reconsidering its plan to build a corporate campus in New York after facing a wave of opposition, as first reported by Crain's New York Business. Can everyday people come together and effectively organize against creeping overreach of one of the world's biggest corporations? 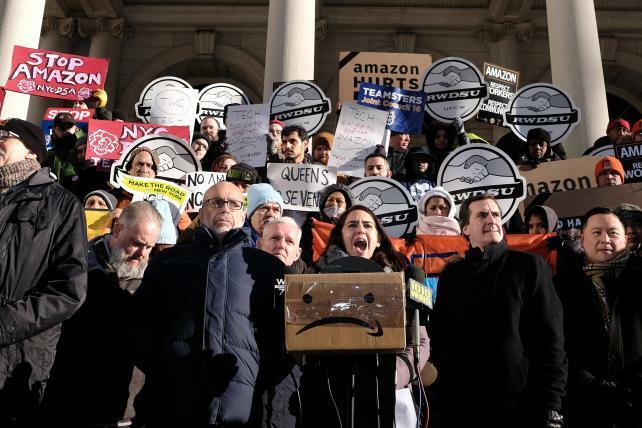 The company's brass had to endure a series of hearings in the City Council in recent weeks, in which politicians blasted Amazon's record on labor issues and its refusal to accede to a unionization drive at its Staten Island distribution center. But the local legislature is powerless to stop the Long Island City campus from advancing, since Gov. Andrew Cuomo's Empire State Development has put the development into a "general project plan," which bypasses municipal zoning and land use regulations. Such is not the case with the state Senate, however. A general project plan requires the unanimous approval of all three members of the Public Authorities Control Board, who are selected by the governor and the heads of the state Legislature. Earlier this month, state Senate Majority Leader Andrea Stewart-Cousins nominated as her representative on the panel Queens state Sen. Michael Gianaris, whose district includes the proposed site—and who is an outspoken critic of the $3 billion in state and local tax breaks and subsidies Cuomo and Mayor Bill de Blasio proffered to Amazon. The governor must approve Gianaris' appointment, but has not yet signaled what he will do. Still, it signaled Stewart-Cousins' hostility to the project. In December, Qunnipac Unviersity polled 1,075 registered voters in New York City and 57% said they approved of Amazon coming to Long Island city, while 26 percent said they opposed the move. But people were divided when asked about the nearly $3 billion financial incentives on offer, with 46% supporting them versus 44% who opposed the package. The shares initially dipped when the Washington Post report was posted Friday but then quickly gained back some of the loss. Amazon was down 2.3 percent at $1,576.98 just before noon in New York.